Posted 31 October 2010 in Bonus, Cooke Looks, Jimmy Olsen #135. I think I caught a hint that this guy Kirby was a genius early on, especially in his Jimmy Olsen series, when all of his abilities started to coalesce for me: His unique dynamic drawing style (even when muted by Colletta’s oft-inappropriate, feathery inks); his unrelenting, pile-driving, never look back storytelling; his delightful, sometimes wonky dialogue, so melodramatic and so… so Warner Brothers, I guess! ; the overarching cheeriness of his comics, urging us kids to come along and have some fun; and, maybe the most important aspect, his lack of sentimentality about the nature of man but (albeit guarded) optimism for life itself: the vision of Jack Kirby. While much of this issue is exposition and setting up for the “time-bomb” of the story to come, we still get to relish again one of Jack’s longest running devices: The good old fashioned slugfest, with “Giant Jimmy” beating the Krypton out of Kal-el… Nobody, but nobody does a fistfight better than the King! Upon re-reading there’s always something new to find — or something I think I uncover — and I’m beginning to detect that while Jack depicts authority very often in light-of-day, clean cut imagery, there’s nuances and subtleties that show however good the intentions of the institutions of “our” side, disastrous badness just might emerge… The Guardian clone’s strange brain patterns, the mere fact DNA was used to grow alien monsters, the folly of building super-nuclear reactors in Metropolis’s basement, to name a few of The Project’s creating the opportunity for their own — and maybe our own — demise. Do I detect an uneasiness emerging from Jack about science and technology, and a yearning for a return to the Garden, so to speak, the pristine nature of New Genesis and the Wild Area? Themes are beginning to take shape and come into sharp focus. And next entry, Jack lays his cards on the table just what the coming battle is all about, as we move on to the second-released title of his Fourth World opus. They belong to sunrise — they’re here in mid-day — to stop the spread of night! Yes, Kirbyheads, here come The Forever People of Supertown! Sadly, tragically, nothing remotely like the scene on the cover actually occurs inside. It’s almost as though whoever put it together (Adams was involved, but did he have anything to do with the theme?) 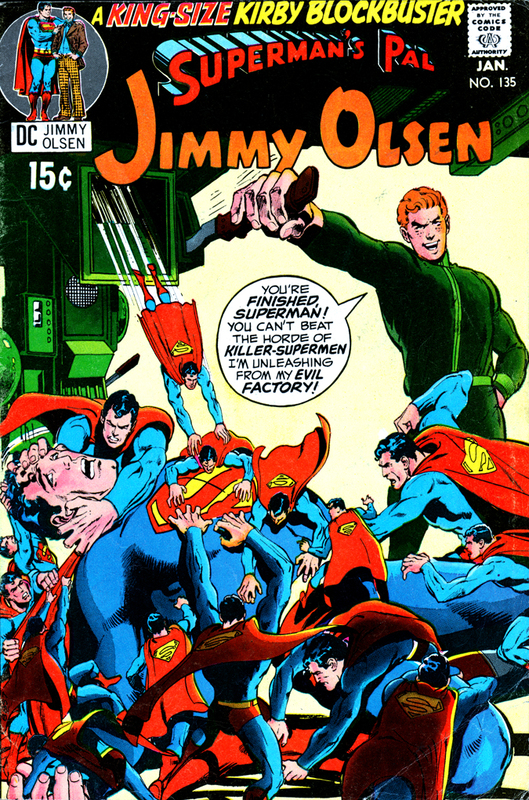 got three bits of info — there’s an Evil Factory, the Evil Factory has an evil Jimmy Olsen, and said factory produces mini-Supermen — which, while accurate, would leave a lot to the imagination. As for “File 202,” I maintain that it was the designation for the charts that hold “The Secret of Life” (to quote the Big Red S) on page 19 of JO #136. At no point are these charts, which take up an entire room, ever referred to as files, but they sure seem to be what the remarks about “File 202” at the beginning of JO #135 were going on about. I’ve noticed the covers of these old comics rarely show things that don’t appear in the book. This might be an obvious statement, but I’m kind of a comics neophyte, so I’m not sure how prevalent this practice is. Like Jimmy running down Supes in JO #133. When I first opened the Omnibus (my first experience with Kirby btw) I assumed the regular JO reader would be shocked to see him “GUN HIM DOWN!” on the cover, but then I looked at JO #132 and Jimmy’s selling Supes (and Clark’s identity) out to gangsters with Kryptonite handcuffs. I’m guessing it doesn’t quite go down that way in the story. This one really takes the cake though. I wonder if there is a collection of misleading comic book covers somewhere. Is this a Golden/Silver/Bronze age thing, or is it pretty much consistent through comic history?